It’s been a few months since we made a cocoa tablet from raw cocoa beans, which we used to brew two different Porters. We already told you about the first one, a more or less standard Porter with lactose, cinnamon and vanilla that we named Chocolatatic Porter. Now it’s turn for the second one of these beers. In this case the recipe was less conventional, since we used tangerine juice and zest. Like other beers we’ve brewed, this time the inspiration came from a commercial beer, Tangerine Porter from Tempest Brewing. We tasted it and we liked enough to brew a similar beer. We named this one Tangerine Porter (yes, I know, same name. My bad, at least in Spanish the order of the words is not the same). Grain selection was based on one hand in the available information of the Tempest Brewing beer we wanted to imitate and on the other hand in the experience from other beers we’ve brewed. We had definitely learned some things though these years and it’s time to start using this knowledge. Most of the grist, more than three quarters, consisted of Maris Otter, an English base malt we though was more than appropriate for the style. To this base malt, we added four specialty malts that allowed us to get, or at least try, the parameters we were looking for. There was, of course, chocolate malt, a must for Porters, for flavour and colour. 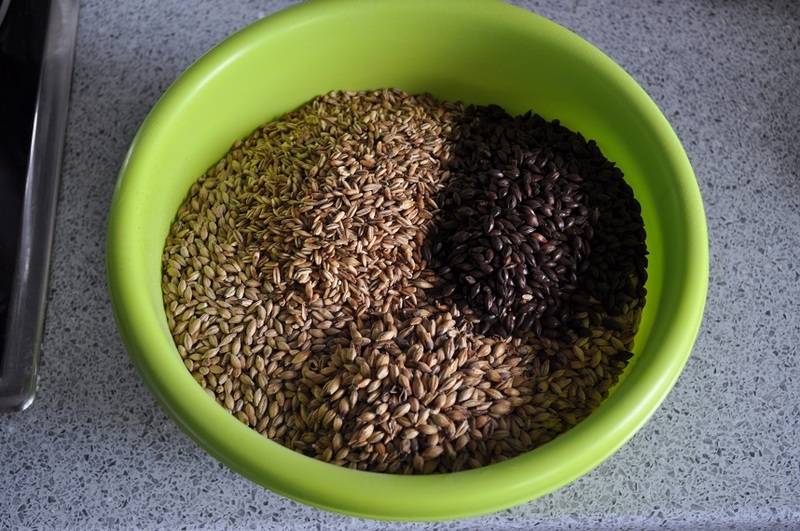 Then Biscuit malt and crystal malt (Crystal T50 from Simpsons to be exact) to contribute some maltiness, and finally, naked malted oats (also from Simpsons) to add some more flavour and, above all, some body that could be thinner adding tangerine juice. We didn’t think too much about hops and yeast. Chinook boiled for 60 minutes to get most of the IBUs needed for the target bitterness and some Cascade at flame out to try to get some citric notes for the hops that could interact with the notes coming from the tangerines. The chosen yeast was Safele S-04, the famous English strain. We started the brewday setting up everything and boiling the water we were going to use to remove chlorine. In the afternoon, after crushing the grain, we mashed in with 5 liters (1.32 gallons) and the different grains. Target temperature was 66ºC (150.8ºC), and we nailed it the first minutes of the mash. Then we opened the lid of the cooler a couple of times to stir the mash and the temperature dropped to about 63ºC (145.4ºF) after one hour. We mashed out adding 3.5 liters (0.92 gallons) of boiling water to get 72ºC (161.6ºF), stirring thoroughly for 10 minutes. Once we removed the bag with the grains, we boiled the wort adding hops and the cocoa tablet at the times showed above. When we added the cocoa tablet we stirred with a wooden spoon to aid mixing well. After finishing the whirlpool with Cascade hops, we cooled the wort until it reached 20ºC (68ºF). During that process we also took time to rehydrate the dry yeast we were about to pitch. Before pitching we transferred the wort to a 6.25 liters (1.65 gallons) PET bottle, shaking it to oxygenate as much as possible and we put it in a fridge. We set the fridge at 17.5ºC (63.5ºF), considering we wanted a fermentation temperature of 18ºC-19ºC (64.4ºF-66.2ºF). Original gravity was a little bit higher than expected (1.054 vs 1.050), due to the fact the evaporation was more than planned. Finally, after pitching yeast, we cleaned everything before getting a well earned rest. Next morning, 12 hours after pitching, fermentation activity was visible, with a good krausen already present. It had a nice chocolate colour and the temperature was about 18.5ºC (65.3ºF), the same we were targeting. Fermentation kept on showing signs for the next 3-4 days and then these sings disappeared. 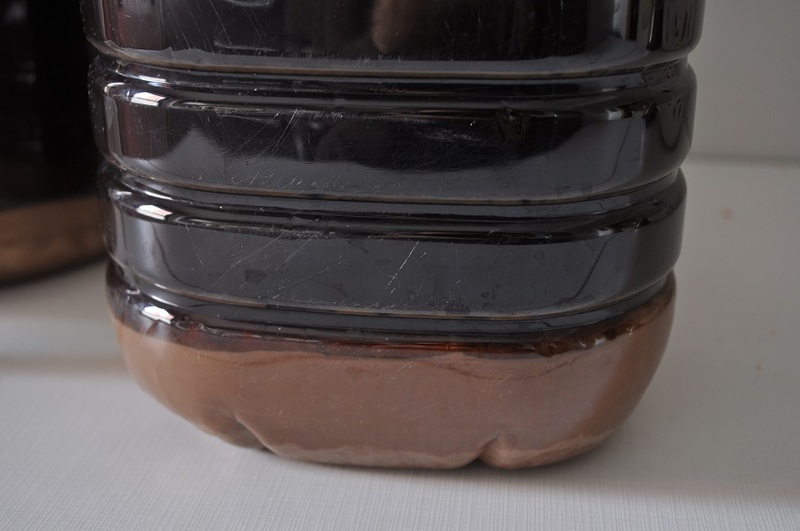 Some trub (cocoa and yeast) started to sediment at the bottom of the PET bottle. We left it that way for a few more days. 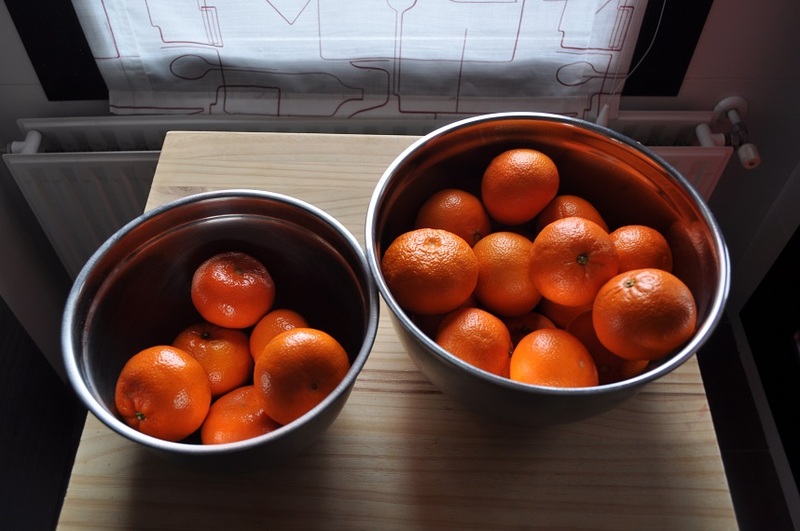 Two weeks after brewday we squeezed the tangerines (from two different varieties) and zested two of them to soak the peel in vodka for a few days. We kept the juice, about a liter (0.22 gallons) in the freezer for one hour and then we put it in the fridge for a few hours. Finally, the night before transferring the beer to a secondary fermenter, we kept the juice at room temperature for a while. Before adding the juice we took a gravity reading. Gravity at that point was 1.010, with the beer having a nice and prominent cocoa aroma. After adding the juice the total volume was about 5.5 liters (1.21 gallons). Shortly after, due to the sugars from the juice, fermentation started again. However, these sings of fermentation stopped after a day. Twelve days after adding the juice, we finally found some time to bottle the beer. We bottle almost 5 liters (1.10 gallons), 14 bottles of 33 cL (12 oz). 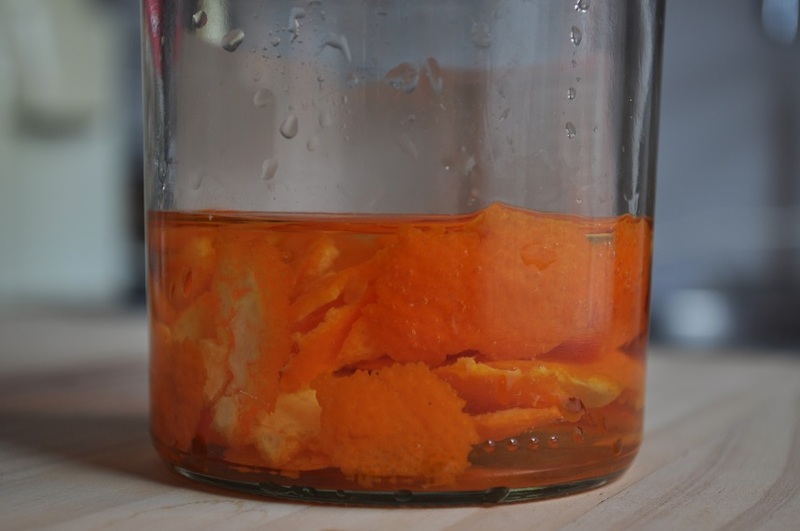 We added the vodka in which we had soaked the tangerine peels and enough sugar to get a final carbonation of 2.0 volumes of CO2 before bottling. Final gravity was 1.008, a little bit lower than the theoretical value. This and the fact that original gravity was higher than planned, made the beer stronger that we aimed to, about 6.0% ABV (probably a little bit more due to the sugars in the juice). 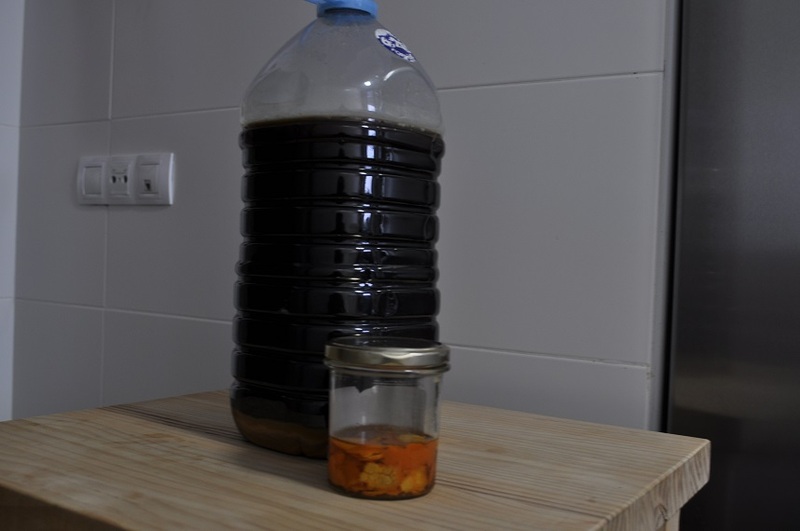 In a few weeks we, after carbonation in the bottles was finished, we would be able to taste our two beers brewed with pure cocoa, this Tangerine Porter and Chocolatastic Porter. We’ll show you soon how was the final result. This entry was posted in Elaboration and tagged cocoa, fruit, Porter, tangerine. Bookmark the permalink.